In the 1880’s this address was the northern fringe of London, as the city grew so did the congregation of this Anglican Church until 2002 at which time it was closed. Starting in 2009 with the financial support of the City of London through an affordable housing initiative we re-developed this building into a fantastic, high efficiency twelve unit apartment building. 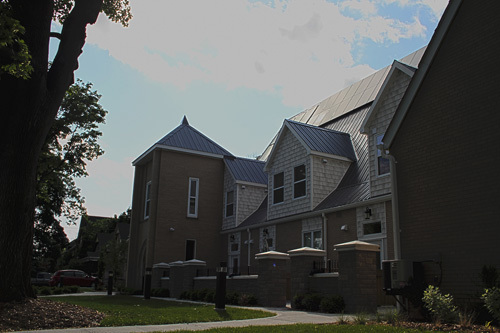 It was custom converted and nine of the twelve units are fully accessible for sixteen developmentally and physically disabled tenants supported by the Alice Saddy Association. This building was designed and built with many components that exceeded the Ontario Building Code and have many security and energy efficient features which are controlled by a micro-computer automation system. This assists in controlling the operating costs in respect to heating/cooling, hall and stair way motion sensor lighting which allows very affordable rent since all the tenants are on ODSP. An elevator allows the former parish hall basement to be utilized as a community gathering place for these disabled tenants. This building is not only energy efficient but it also is a power generator and sells electricity to the grid through its 54 solar panels mounted on the south face of the steep pitch roof. Another 6 large solar panels utilize the sun to preheat the domestic hot water for the tenants therefore reducing operating costs. All the tenants participate in the Cities recycling program.